Here you find an overview of regional and national online databases, which guide you to artist-in-residence opportunities. The databases are run by online platforms, which mostly serve their regional and local audience - often in their own language. They also publish calls for applications and give background information. The TransArtists desk connects and collaborates with these fellow platforms. Please visit their websites if you want to get a closer and more detailed look on artist-in-residence opportunities in a specific region or country. Please note that this list will be carefully checked and updated in the coming weeks. Thank you for your understanding! China Residencies is a new platform aiming at creating a comprehensive directory and an online platform for visiting artists and hosting organizations in China. Its other missions are to foster successful creative exchanges by strengthening the network of programs, as well as to research organizational best practices, archival systems, and mapping exchange. Since 1950's the Finnish Artists' Studio Foundation has promoted the opportunities of Finnish artists to work abroad, with it's own studio houses in Spain and Italy. FASF also maintains a database of all Artist-in-Residence programmes of Finland. Touring artists, an information portal for artists working internationally, provides comprehensive information on visas/residence, transport/customs, taxes, social security, other insurances, and copyright. Through a joint project of the German Center of the International Theatre Institute (ITI) and the Internationale Gesellschaft der Bildenden Künste (IGBK; English: International Association of Art (IAA) in Germany), these topics have been examined for both the performing arts and the visual arts. Host an Artist is an online exchange platform for property owners and artists. Owners of summer houses, bungalows, apartments,warehouses, empty offices can share their space with artists as temporary artistic residencies. In exchange for this hosting, artists will offer a work of art, an original work, singing or painting lessons, a private concert or any other art form to create a unique link between themselves and their hosts. The platform mainly lists French residences, but also offers a few international ones. AIR_J is a website dedicated to disseminating information about artist-in-residence programs across Japan to those living abroad who are interested in AIR programs and culture of Japan. It also offers the cross-searchable database of AIR programs, FAQ, interviews and essays to update the user with the latest information of AIR programs in Japan and abroad. AIR_J is an initiative by The Japan Foundation. AiR Platform NL is the portal to the artist-in-residence sector of the Netherlands and Flanders. The Platform gives up-to-date information about the temporary availability of work and residential spaces in guest studios in the Netherlands and Flanders. The platform works for making contacts, for the mutual exchange of information and experiences, and for the establishment of collaborations or projects. Latin-America: residency_network iberoamerica is an Ibero American platform of spaces working with research, production and exhibition of contemporary art and culture, connected particularly through its residency programs. It brings together different formats of art residencies and enhances its diversity. Nordic Culture Point offers a database of all international art residencies in the Nordic Countries. They provide information and consultancy to professionals within the field of culture and serve as a secretariat for the framework programmes of the Nordic Ministries of Culture. ArtResideRUS collects and distributes information and expertise on artist-in-residence opportunities in Russia. ArtResideRUS was launched in June 2010. ArtResideRUS should be regarded as more than only a network of existing Russian AiR programmes, it is also a group of experts and organizations, representing the potential of the AiR concept in Russia. ArtResideRUS is there to give an impulse to the potential for AiR in Russia, in a pragmatic, step by step way. Are you looking for a studio for exchange? Are you organising an art event? Do you need collaborators, participants or public? Publish your message at Artservis Forum! There is room enough for various topics. Although it has been conducted in Slovenian language, there is the English Speakers Corner for non-Slovenian language speakers. The majority of artists’ residencies programmes in Slovenia are listed on www. culture.si, a website supported by the Ministry of Culture, which is designed to help professionals explore possibilities for collaboration with Slovene cultural organisations. Artmotile is a platform providing information and resources on Spanish artist in residency (AIR) programmes, as well as information related to artist mobility in general. Artmotile was established in 2009 as an independent, non-commercial organisation, based in Barcelona. This is the informationpool and interface between artists in residence and exchange and guest studios in Switzerland. Network for artists in residence among eachother as well as with swiss artists. Faciliation of cultural exchange in general and promotion of international and national artists exchange in particular. Since 2000, the Ministry of Culture (then Council of Cultural Affairs) has engaged in cultural diplomacy by partnering with artist villages in the USA, France, Australia and the Czech Republic. By establishing the "Arts Residency Network, Taiwan", a bilingual, easy-to-understand website, the Ministry of Culture aims to compile information on local and international artist villages and provide an platform for exchange and services for local and international artists, curators and arts and cultural institutions. "The Alliance" gathers the interests of more than 500 artists' communities in the United States. The Alliance website gives an extensive database of all artist-in-residence opportunities in the USA, artists' experiences, know-how, support. 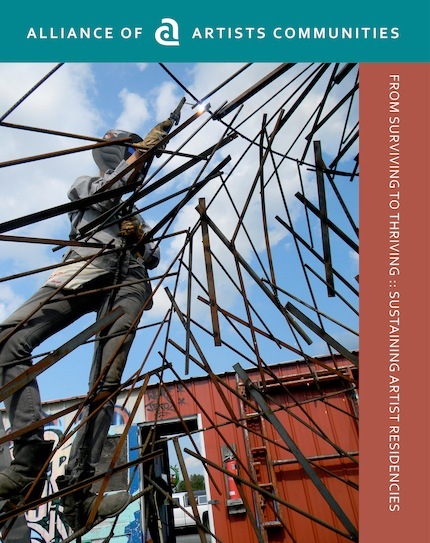 Over 2010-2011, the Alliance of Artists Communities set out to explore the question, "What is organizational sustainability, and how might it apply to artist residencies?". The resulting report is available for download! Read more. In February 2012, a meeting on performing arts residencies was held in Yokohama and Kyoto in connection with TPAM in Yokohama. This program explored the possibilities of Artist In Residence (AIR) programs in the performing arts, with a strong focus on Asian opportunities. Find reports of the meeting here.